I upgraded to WordPress 2.5.1 today due to some major security issues (German link) and was reminded that one of my widgets was not working correctly. Nathan Oliphant wrote this widget to display bookmarks in the sort order of the users choosing. Unfortunately, it had two minor bugs which 1. caused changes not to be made persistent correctly with recent WordPress versions and 2. broke proper sort order selection. I fixed those bugs and added optional support for Ozh’s Click Counter plugin. Today, I wrote a simple MyBB plugin, Registration eMail Check (RMC). The plugin first verifies whether the email has a valid format, then compares the email host with a number of hosts which were explicitly disabled by the administrator (the plugin comes with a decent list of well-known one-time address providers), and finally tries to communicate with the corresponding mail server in order to verify whether the address actually exists. I wrote the plugin for two reasons: First, because I wanted to prevent automated bot registration with non-existing email addresses. When I look through lists of users waiting for activation I find an ever growing amount of accounts which were obviously generated automatically, using non-existing email addresses. Second, because I don’t want people to use anonymous one-time email addresses when registering in forums where a certain mutual trust is mandatory. I saw the following advertisement on AutoScout24 today. 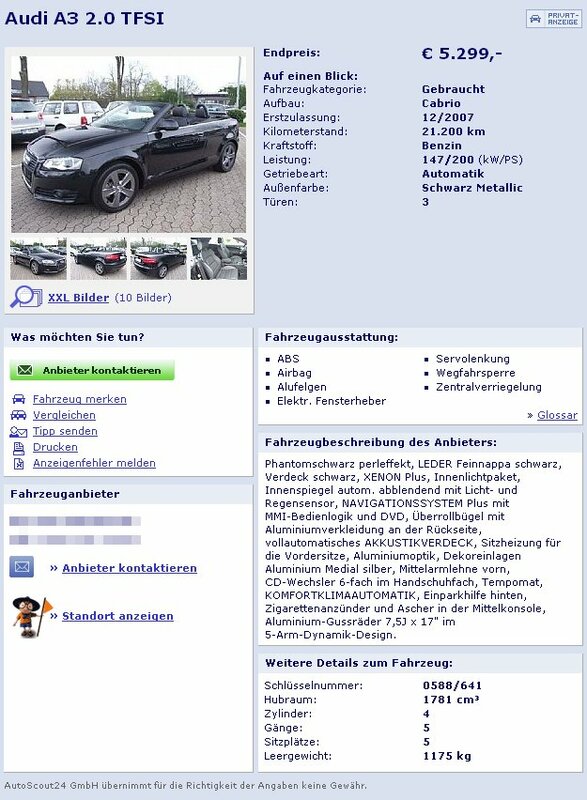 5300 EUR for a 2007 Audi A3 ragtop. This looked too good to be true, indeed, but still I couldn’t hesitate to contact the seller. The telephone number shown in the ad turned out to be a fax number, so I tried to get in touch by email. I received a reply about 15 minutes later.